In Victoria, tobacco is grown along the river valleys of the Ovens, King and Kiewa Rivers and their tributaries in North East Victoria. manufactured domestically and the multiplier effect on employment and manufacturing investment is significant. Tobacco is a member of the family Solonaceae, the same family as potatoes and tomatoes. In Australia, flue cured tobacco (Nicotiana tabacum) is the only type of tobacco grown. Tobacco was first grown shortly after the first fleet arrived in Sydney, but these early attempts were largely unsuccessful. 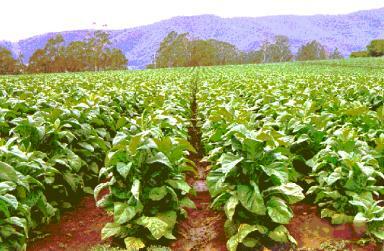 Interest in tobacco growing increased in the early 1930's following the introduction of American flue cured varieties. Areas with suitable soils and climate were identified and considerable expansion occurred. This expansion was encouraged by both State and Federal Governments in the 1940s, '50s and early '60s. Despite this, between 1932 and 1948 the area planted in Victoria declined from over 4,800 to 400 hectares. In 1936 the Local Leaf Content Scheme was introduced by the Commonwealth Government as a form of support to the industry. This scheme required manufacturers to use a set amount of locally grown tobacco. This amount was initially 7.5%, which increased to 28.5% in 1960 and increased to 57% in 1977. Expansion of production in the late 1950's and early 60's resulted in the over-production of tobacco and an increase of production into areas less suited to the growth of high quality tobacco. 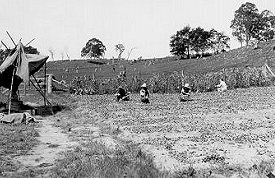 Poor tobacco was no longer saleable and many growers faced financial difficulties, such as in 1961 when 2000 tonne was left unsold. Faced with a difficult marketing situation, State and Federal Governments, growers and manufacturers agreed to a Tobacco Industry Stabilisation Plan (TISP) which commenced operation in 1965. Constitutionally, powers to control production lie with the State Governments whilst tariff setting is a Commonwealth responsibility. Thus in order to implement a national TISP that involved supply controls, statutory usage requirements and a tariff, there was a requirement for separate but complementary State and Federal legislation. At the Federal level, the Tobacco Marketing Act 1965, gave the Australian Tobacco Board, (later changed to the Australian Tobacco Marketing Advisory Committee) its basis. An import tariff was also introduced which gave further protection to the industry. the authority to control production through a quota system and to be solely responsible for marketing tobacco on behalf of growers. All tobacco grown was vested in the TLMB. The Victorian Tobacco Leaf Stabilisation Act 1966 was also introduced and complimented the Federal Tobacco Marketing Act. In December 1993 the Victorian Government announced a restructure package which was built around a $3 million grant, combined with a plan to introduce the Tobacco Leaf Industry (Deregulation) Act 1994 which repealed the Victorian Tobacco Leaf Stabilisation Act 1966 and the Marketing of Primary Products Act 1958. As part of this restructure, a number of quota holders in marginal growing areas voluntarily relinquished their quotas to the State Government for $2.00 per kilogram and import tariffs were reduced to zero. As part of this restructure, $5.8 million of Government (State and Commonwealth), manufacturer and grower contributed funds went towards relocation of a manufacturer owned green leaf threshing plant from Melbourne to Myrtleford, and transfer of the ownership of this plant to the Tobacco Co-Operative of Victoria (TCV). 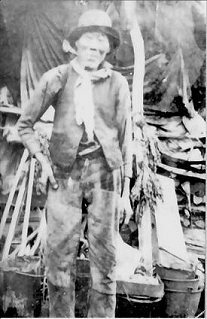 The threshing plant was operational at the start of the 1996 season. The Tobacco Leaf Industry (Deregulation) Act 1994 was also the mechanism through which the assets of the TLMB were transferred to the new Tobacco Co-Operative of Victoria, which occurred in September 1994. Tobacco growers in Victoria are all shareholders of the TCV, and can produce for sale an amount of tobacco which equates with the number of shares held. This share arrangement has replaced the quota system which operated under the TLMB. The amount of tobacco produced per share is set at the start of each growing season after contracts are negotiated with manufacturers to supply them with tobacco. The TCV also threshes tobacco under contract to manufacturers. Growers who produce high quality leaf have been able to stay in the industry under these arrangements and have been able to consolidate and increase production.